I had no idea what to expect when I started reading this book. I saw the cover and thought why not? After reading the first couple of chapters I decided to read the synopsis. (I have this tendency to skip the synopsis and just dive into the story. I find that I enjoy books a lot better this way. Synopsis can be misleading sometimes.) 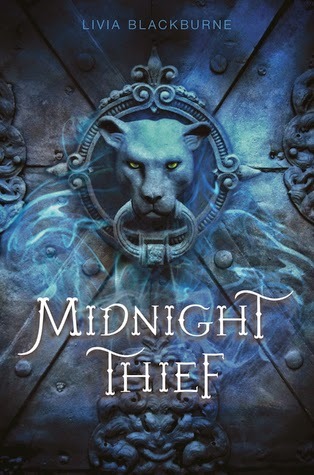 Midnight Thief moved at a fast pace and delivered surprise after surprise with every page I turned. There is even a nice twist at the near end of the book that I did not see coming. It sort of came out of nowhere, but yet fit the story so well. It also made a lot of sense why Kyra is so good at what she does. I also did not expect a romance to really bloom between any of the characters. There was so much mystery and suspense that I was too concerned with whether or not Kyra would survive her missions. Kyra was such a great heroine and so well written. She has to be one of my favorite female characters out of all the books I've read so far in 2014. She was super interesting and very likable. I actually liked all the characters in the story. I don’t have one complaint about any of them. This story was amazing and I think it’s suitable for readers of all ages. There is a prequel to the story called Poison Dance, and it’s currently free on Amazon. I will be diving into that one soon. I am a new fan of Livia Blackburne and I cannot wait to read her next book. I have no complaints about the Midnight Thief. I enjoyed it tons!